Where did all the world religions come from? Do all good people receive the same reward, or is there only one way to eternal life? Many of us did not choose our religion. Most likely, we were born into a family that guided our religious understanding, or we were brought up in a country that shaped our beliefs and patterns of worship. Yet proving that our belief is correct compared to others can be a daunting task. Factions and divisions exist within every religious group, large or small. Millions have been slaughtered over the centuries in the name of “righteous warfare,” as various religions battled any who believed differently. Religion is supposed to be the way to peace in this life as well as the path to a peaceful afterlife. But life here on earth has not been peaceful. The history of religion confuses many, even causing them to turn away from religious beliefs altogether. This is true of many who lived through the butchery in the name of God in World War I. Troops on both sides—many belonging to the same denominations—prayed for victory, presumably to the same God. The attack on faith worsened with the next generation, which fought World War II. How could a religion that comes from God cause and condone such suffering? Hitler thought he was serving God by persecuting the Jews. The destruction of faith has been an unspoken fatality of war. “Be sober, be vigilant; because your adversary the devil [the chief evil spirit or demon] walks about like a roaring lion, seeking whom he may devour. Resist him, steadfast in the faith, knowing that the same sufferings are experienced by your brotherhood in the world” (1 Peter 5:8-9). How do you hold your ground in this spiritual battle if you are not even sure about your faith? The first step is to determine that God truly exists. The next step is to determine whether He has provided us with any means of guidance. That is, has our Creator told us what He expects of us? Has He told us why He created us, where we are going, what our ultimate potential is? Has He revealed a way of life for the present, as well as one that prepares us for the afterlife? If we truly seek God, we can prove to ourselves that God exists. Likewise, we can prove that the Bible is His revelation to mankind. God inspired various writers over 1,500 years to record in Scripture what He wanted us to know. The Creator miraculously caused the preservation of these inspired manuscripts, so that humankind would have the knowledge we require to fulfill the purpose of our existence. After proving God’s existence, we can come to trust what He says through His Word, the Bible. Then we have a basis to answer the fundamental questions about our existence. God’s instruction book for mankind says, “The fear of the LORD is the beginning of wisdom, and the knowledge of the Holy One is understanding” (Proverbs 9:10). The psalmist wrote that God’s “word is a lamp to my feet and a light to my path” (Psalm 119:105). We may also be confident that this mixture of world religions does not result from the activity or inspiration of God. Put another way, not every faith or even every church that claims to speak for God actually represents Him. We are told that “God is not the author of confusion but of peace” (1 Corinthians 14:33). Therefore, when you see only confusion, coupled with ungodly violence or political maneuvering, you know God is not in the picture. Most people want to believe that there is a purpose for life! They want to believe that the complexity of life that exists around us is not the result of random molecular mutations. As scientists discover the complexity and interdependence of life-forms, the presence of a “guiding force,” a divine design, becomes more evident. In fact, the God of the Bible tells us that “since the creation of the world His invisible attributes are clearly seen, being understood by the things that are made” (Romans 1:20). It seems to be part of our makeup and psyche to hope for a grand purpose for this life, and the Bible reveals that there is! But the Bible also shows that at the beginning of man’s history, our first parents rejected the knowledge and instruction from God. It would have saved them a lot of floundering around and misery had they only listened to God. Unfortunately, Adam and Eve rejected God’s instructions, and their descendants ever since have followed their poor choice. Humanity at large now seeks alternative paths to the one commanded by God. Mankind seemingly will accept just about any path as long as it does not involve coming under the authority of the true God! Genesis chapter 3 describes how Adam and Eve ate from the “tree of the knowledge of good and evil.” This meant that they would determine their own purpose for life (apart from God), set their own standards of right and wrong, and use only human reasoning to determine their standards. Continuing this same process, most humans today feel free to change standards of morality as they think appropriate. What God says doesn’t seem to matter to them. In the first recorded lie to a human being, Satan said, “You will not surely die. For God knows that in the day you eat of it [the fruit of the tree of the knowledge of good and evil] your eyes will be opened, and you will be like God, knowing good and evil” (Genesis 3:4-5). His first objective was to separate mankind from God, the source of true knowledge. Satan would then feed humanity further lies in an attempt to control society and thwart the plan of God. God’s fantastic goal is summarized earlier in the Genesis account—to “make man in Our image, according to Our likeness” (Genesis 1:26). God’s purpose in making man first out of clay (a temporary existence) was to shape the character within him. Then through the process of conversion, by which God adds His Spirit to the spirit in man (Romans 8:16), God wants to change humans into spirit beings and bring them into His eternal family. In defiance of their Creator, men and women have chosen to worship animals or their images, the sun and moon (which are responsible for light, life-giving heat and determining the seasons for food production) and even bow before powerful or influential men and women of history—or images of them. “Professing to be wise, they became fools, and changed the glory of the incorruptible God into an image made like corruptible man—and birds and four-footed animals and creeping things … who exchanged the truth of God for the lie, and worshiped and served the creature rather than the Creator, who is blessed forever. Amen” (Romans 1:22-23, 25). The false beliefs injected into man’s society developed into multiple forms of worship, including submission to various lifestyles. There are varieties of world religions to suit national preferences. Others feature historical and mythical heroes, great philosophers, scientific theories and even sports and media personalities. In the Bible we find records of people worshipping a multitude of idols, some requiring the sacrifice of children, others demanding submission of conquered nations and the bringing of tribute to their temples. Perhaps the religious beliefs and practices of this world are best summed up by the words recorded by one of Jesus Christ’s first disciples, the apostle John. Under inspiration he wrote, “So the great dragon was cast out, that serpent of old, called the Devil and Satan, who deceives the whole world; he was cast to the earth, and his angels were cast out with him” (Revelation 12:9, emphasis added). Even the religion that bears the name of Christ—Christianity—has clearly deviated from the teachings of Jesus Christ Himself! This passage makes clear the origin of this world’s religions. Even the religion that bears the name of Christ—Christianity—has clearly deviated from the teachings of Jesus Christ Himself! Jesus said, “Do not think that I came to destroy the Law or the Prophets. I did not come to destroy but to fulfill [fill with meaning]. For assuredly, I say to you, till heaven and earth pass away, one jot or one tittle will by no means pass from the law till all is fulfilled. Whoever therefore breaks one of the least of these commandments, and teaches men so, shall be called least in the kingdom of heaven; but whoever does and teaches them, he shall be called great in the kingdom of heaven” (Matthew 5:17-19). Today we see traditions, ceremony and a form of religion (2 Timothy 3:5) instead of obedience to God’s values and the teaching of the true purpose for human life. Jesus said, “Well did Isaiah prophesy of you hypocrites, as it is written: ‘This people honors Me with their lips, but their heart is far from Me. And in vain they worship Me, teaching as doctrines the commandments of men.’ For laying aside the commandment of God, you hold the tradition of men” (Mark 7:6-8). 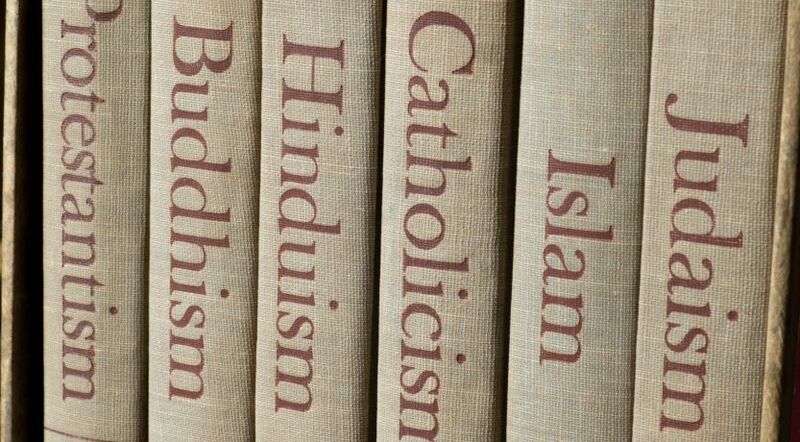 Will there ever be just one world religion? God reveals that He is the only One providing truth and the way of life that can lead to eternal life. Obedience is a choice, made by free will. In this life, where Satan rules the earth until the return of Jesus Christ, those called by God (John 6:44) must struggle against and overcome the influences of this society and their own human frailties (1 John 2:15-17). God has provided these people with a safe haven—the “Church of God”—where they can grow and mature as His faithful and obedient children (Matthew 16:18; Luke 12:32). As a result of the sacrifice of Jesus Christ, all humanity will have an opportunity to choose to follow God’s way. His blood paid for our sins, and there is only one name by which we may be saved from the death penalty demanded by sin (Acts 4:12). God does not want a repeat of the demise of Satan, who was once an angelic being that walked and served near the throne of God in heaven (Isaiah 14; Ezekiel 28). So our training in this physical existence is to develop holy and righteous character with God’s help so we may later be changed into immortal spirit beings at Christ’s second coming. After the return of Jesus Christ to this earth, the knowledge of God’s way of life will flow out from Jerusalem, where the saints will rule with Jesus, the King of kings and High Priest of humanity. At that time, “Many nations shall come and say, ‘Come, and let us go up to the mountain of the LORD, to the house of the God of Jacob; He will teach us His ways, and we shall walk in His paths.’ For out of Zion the law shall go forth, and the word of the LORD from Jerusalem” (Micah 4:2). There will still be free will and free choice, but no one will be able to hide from the consequences of disobeying God’s law. Nations of the earth, including Egypt, will be encouraged to send representatives to Jerusalem at the time of the Feast of Tabernacles (see Zechariah 14:16-19). It may take some time, but soon “they shall not hurt nor destroy in all My holy mountain, for the earth shall be full of the knowledge of the LORD as the waters cover the sea” (Isaiah 11:9). Then there will be only one world religion—the true religion of God.